Dr. Johnny L. Johnson, Jr.
Johnny L. Johnson, Jr. is a native of Bessemer, AL, and he is the second child of Johnny L. Johnson, Sr. and Elizabeth Logan Johnson; he has one brother and one sister. He is a family man with two adult sons, Rev. Daniel I. Johnson and Kevin J. Johnson. Dr. Johnson was educated in the Bessemer city School system. He began his college career at the Birmingham Baptist College, Birmingham, AL, and he completed a Bachelor of Theology at Morris College, Sumter, SC. He has received a Master of Divinity from Erskine Theological Seminary, Due West, SC, and he has also received a Master's of Arts in Counseling Ministry from Erskine. He has earned a ½ unit of CPE (Clinical Pastoral Education) from Anderson Area Medical Center, Anderson, SC. He has also received a Doctor of Ministry degree from Erskine Theological Seminary. Dr. Johnson is a former Moderator of the Tumbling Shoals Baptist Association. He is the former Dean of the South Carolina Baptist Congress of Christian Education. 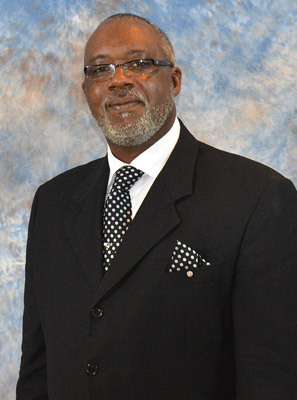 He is currently the 2nd Vice President of the South Carolina Baptist Congress of Christian Education. He curently teaches for the Morris College Extension program; he teaches for the South Carolina Baptist Congress of Christian Education, and for the National Baptist Congress of Christian Education. He is also a proud member of the NAACP. He is currently the Pastor of the White Plains Baptist Church, Laurens, SC, where he has been serving since 1993. His ministry has blossomed at White Plains, and the church has grown spiritually, numerically, financially, and structurally. He loves the Lord, he loves people, and he loves to teach and preach God's Word. Copyright © 2016 - 2019 White Plains Baptist Church and Arche Designs, LLC. All Rights Reserved.